3 December 2018: The annual Graduate Exhibition hosted by the Faculty of Arts and Design was held at the University of Canberra on Wednesday 21 November, featuring a variety of works displayed by students. The exhibition titled Discover showcased the works of more than 300 graduating students. A number of displays across the two levels of the UC Refectory were from a diverse range of areas including but not limited to industrial designers and graphic designers, writers, film producers, web designers, architects and interior architects. Works from students from other areas within the Faculty were also on display from areas such as building and construction management, communication, media, heritage, journalism and international studies. 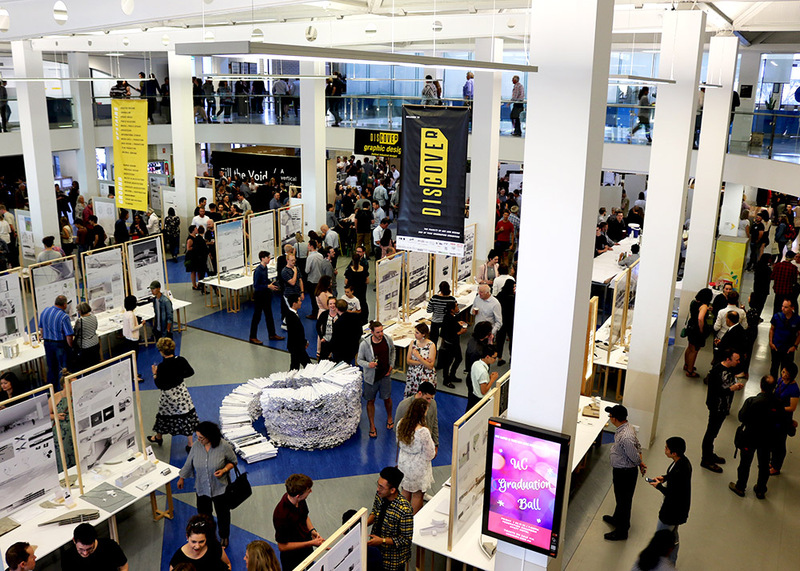 The evening put a spotlight on student’s creativity, hard work and the array of prominent courses that UC’s Faculty of Arts and Design has to offer. Professor Nick Klomp, Deputy Vice-Chancellor at the University of Canberra has applauded students hard work and dedication. “I cannot put into words how proud we are of all our graduating students, I can’t give them high enough praise for all the hard work they have completed this year,” Professor Klomp said. Professor Klomp also added that the exhibition is one of the best platforms for students to exhibit their talents to an audience of industry professionals, family, friends, and to the wider community. Participating film production student Josh Wichaison relished the opportunity to show his work to industry professionals. The exhibition was a particularly memorable night for journalism and graphic design student Lewis Haskew, who was announced as the winner of WIN News Peter Leonard Scholarship for Journalism. “I’m absolutely stoked to have taken out the Scholarship for 2018, it’s awesome to be part of such a long list of accomplished journalists who’ve previously taken out the award. I’m also really excited to now head back to WIN to further develop my skills and see where my career takes me,” said Mr Haskew. The scholarship includes a three-week placement at the WIN Canberra Newsroom and a $2,500 prize.